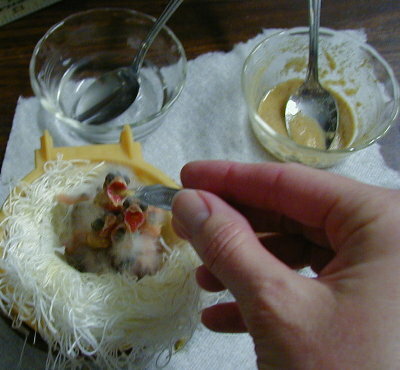 Unlike breeders of pet parrots, canary breeders usually let the parents do all the feeding of their chicks. This does not mean that you cannot intervene occasionally, especially if you have a bird that hatches a day or two later than its nestmates. Exclusive hand-feeding is an all-day job, but you can sometimes save a "runt" by giving it just one or two booster feedings a day. It is important that newly hatched chicks go to sleep with a full crop their first night, so if you feed a late-hatched bird at dusk, it could make the difference in survival without any additional human feeding. Once a chick gets too weak to beg, it is doomed. Feeding the smallest chick in the nest in the morning can give it the strength to compete all day. So, unless you are a strict "Darwinist," be prepared to hand-feed your canary chicks if it becomes necessary. It is not much bother if you limit yourself to two feedings a day. The easiest method for hand-feeding is to use a commercial formula. There are several brands; I use Kaytee Exact Handfeeding Formula for Baby Birds. It comes as a powder that you simply mix with warm water as needed. For newly hatched chicks, you can use the wide end of a flat toothpick as a spoon. I also use the metal tool that is used for expanding plastic leg bands because the tip is like a tiny spoon. Mix just a little amount for each feeding; do not save the leftovers for later, the risk of spoilage is not worth it. The tiny chicks are so transparent that you will see the food going into their crop as they eat. When they are full, they will stop begging, then usually sleep. Try to clean up any spilled food, it can harden and form a crust on the chicks and restrict growth or blood circulation, especially on the feet. Dab with a piece of dry tissue and most of the food will stick to it. Also have a little bowl of water ready to moisten tissue to wipe their faces clean if necessary. Hookbill hand-feeders usually use a syringe to put the formula directly into the chick's crop, but I do not recommend this for canaries. Just drip or dab the food into the canary's beak like the parents do and the chick will swallow it on its own. Let the chick swallow and breathe between each mouthful. When the crop is full, it will quit begging. Don't try to force it to eat more than it wants. Sometimes, they gape like a yawn and lick or smack their beak clean when they are full. This is not begging, so don't try to force more food at this point. Begging is usually distinguished by wing flapping and cheeping. Sometimes it can be very difficult to get a new hatched chick or a very weak chick to beg. I found it best to prop them up and tilt the head up so the beak is pointing skyward. Gently stroke them under the chin. Tapping them lightly on the top of the head can also work, that is how the parents wake them when they want them to eat in those rare cases where the chicks don't notice their return. Another trick for feeding the very weak chick is to just put some watery food on the tip of the beak. Even with the beak closed, the chick will realize something is there if it is at all conscious. Then it will open slightly to lick its beak to clean it. That is when you need to be ready to shove in a tiny mouthful! If you can keep the chick and the food warm, it will perk up fairly quickly once food gets to the crop and hopefully open its mouth again so you can put more food in. Don't force food in or overstuff it. Also don't burn the crop with hot food. I keep everything warm by putting the chick and the food in little bowls that float in larger bowls of warm water, the "double boiler" method. Like banding, the more you do this, the easier it gets. Every canary breeder should keep a supply of hand-feeding formula on hand. Good luck, hope you do not have to do any handfeeding, but please be prepared in case you do. Band removal tool used for feeding spoon. With a large nest of 5 like this, supplimental feeding just before dark insures that all chicks get fed and grow equally.